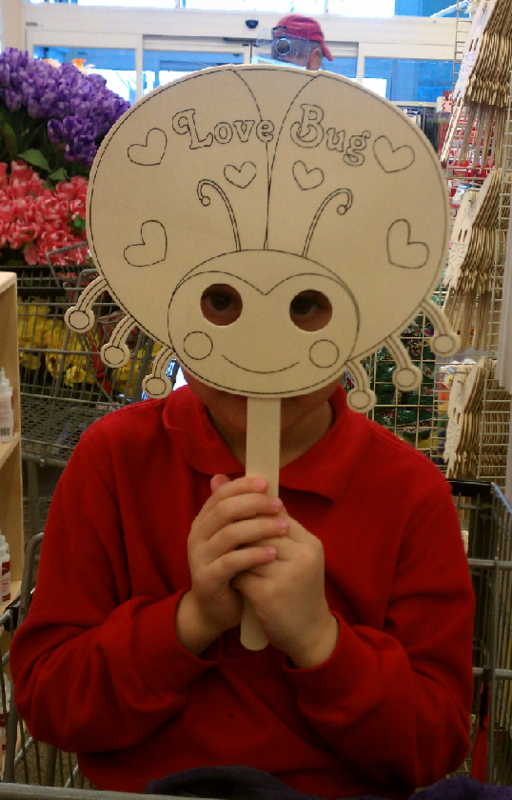 Here’s a smile for you – my son holding up this love bug mask and saying “Hello Spring”! How can you resist? I had some good luck with flea market finds this month and found some great knick knacks. I’m not sure what this first item is; it is some type of souvenir tray from Florida. I think this might be for carrying drinks? If anyone knows, please tell me! 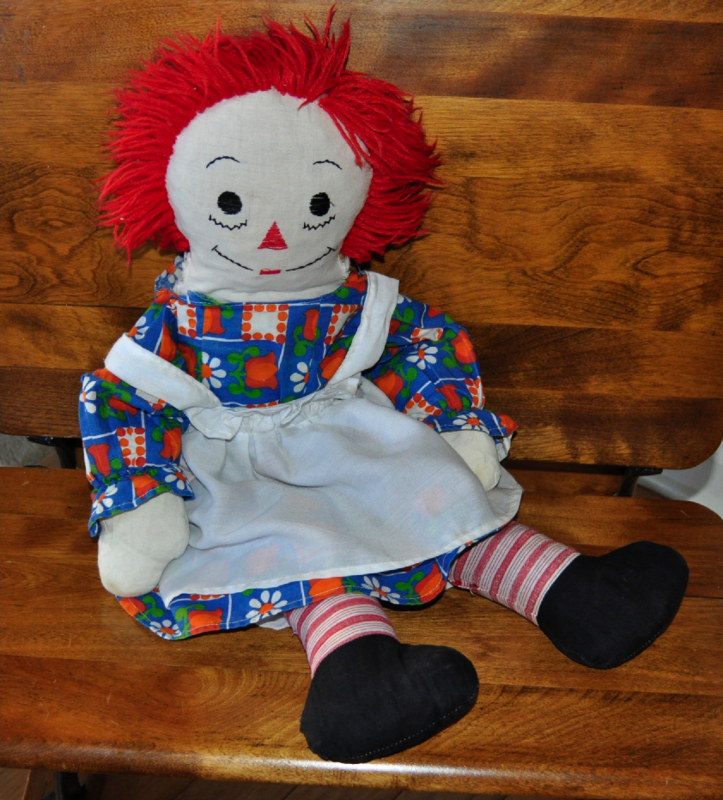 This is a handmade Raggedy Ann doll. Her face is hand embroidered and she is stuffed with fabric scraps (very old-fashioned). I figure she was probably made in the 60’s or 70’s based on the fabric used for her dress. I plan to make a new dress for her from my plethora of civil war fabric. She looks perfect sitting on the school desk I found a few months ago. 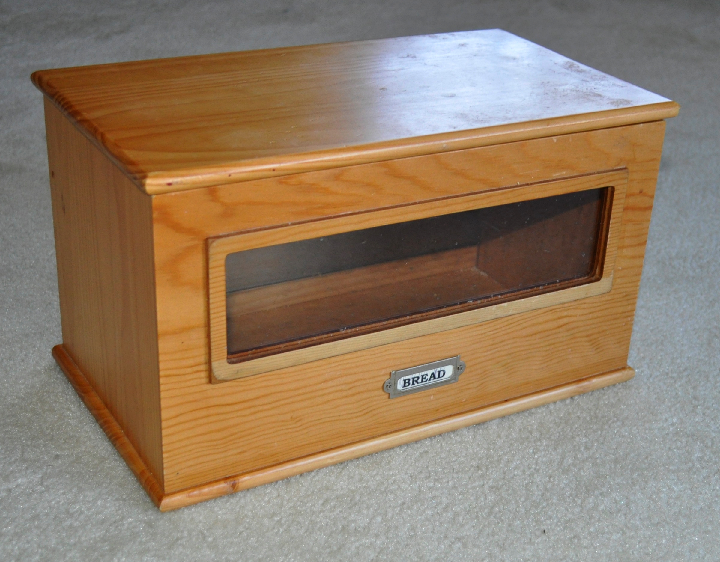 Here is a wooden bread box. It needs a bit of cleaning (there are crumbs in it), and I may end up painting/distressing this. It would make a perfect sewing box – especially since you can see your project through the window. 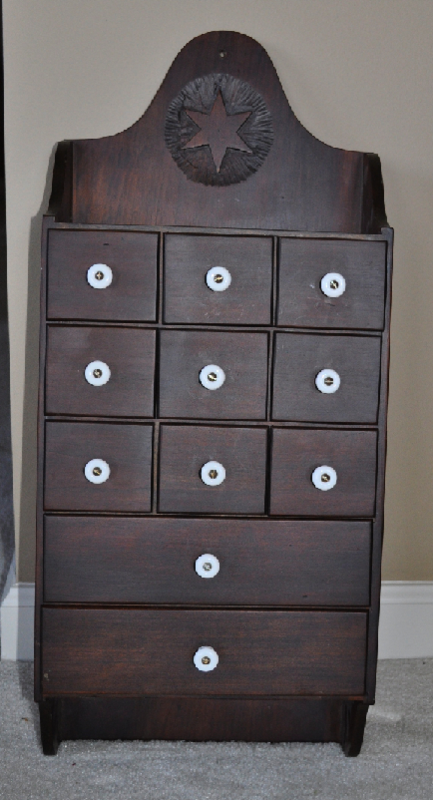 When I saw this piece with the handcarved star and the little drawers, I had to have it! According to the signature on the back, this was made in 1986, which makes it 26 years old – so it just qualifies as being vintage! Lastly, here is a very clever tote bag. This is made from a paper-pieced quilt block that shows a girl jumping rope. Do you see how her rope is actually the handles of the bag? Also, I love her braids! Good luck with your flea market finds! If you find something fun, let us now by posting in the comments. 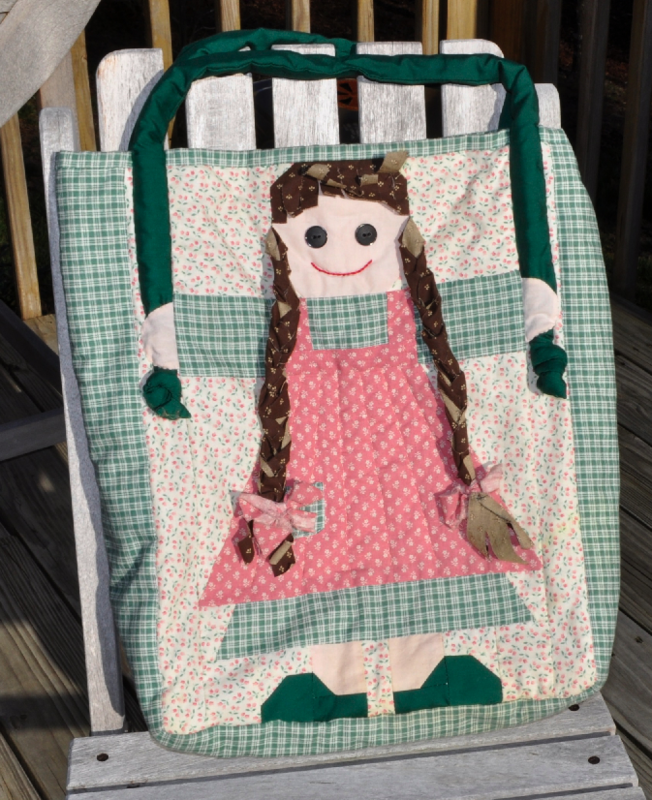 This entry was posted in Dolls and Softies, Flea Market Finds, Household, Organization. Bookmark the permalink. The jump rope handles are adorable. However, I REFUSE to agree that 1986 qualifies as vintage! Haha! From what I understand, vintage is defined as anything that is at least 25 years old :). 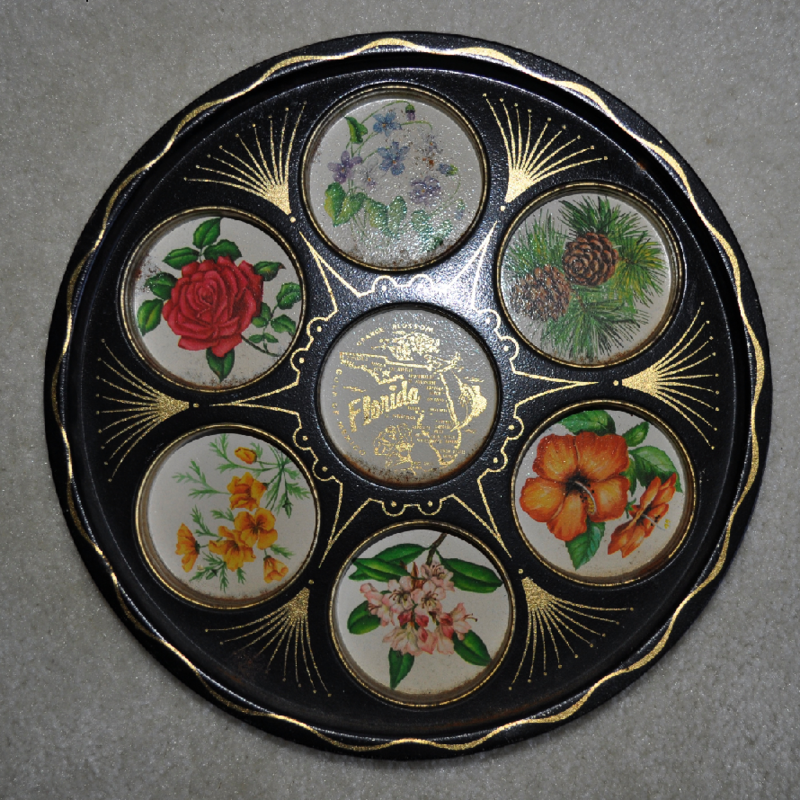 The tin tray via Florida was used to carry drinks to guests. I would say it is from the late 50s or early 60s. You have some great discoveries!!!!! Thanks for the clarification Mrs. B. That seems to make sense! Very interesting, but don’t let Grandma see the doll. Hers were very authenic. Look to see if she has a heart embroidered on her chest that says I love you. I checked, and she does not have a heart! I will have to add one.